A growing body of research shows that when it comes to bone health, ensuring optimal intake of vitamin K is a critical piece of the puzzle. New research is focused on the synergistic relationship between vitamin K (specifically, vitamin K2) and vitamin D3, especially in terms of bone strength and cardiovascular health. 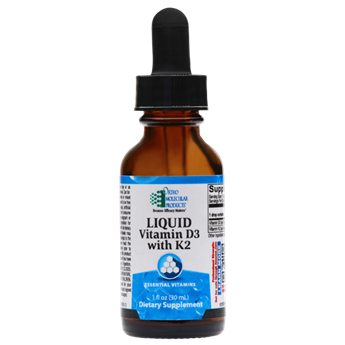 Liquid Vitamin D3 with K2 includes 10 mcg of vitamin K2 (as MK-7) and 1,000 IU of vitamin D3 per serving. The tasteless liquid formula can easily be combined with any beverage.